The north-facing Anais Villa has lots of great features, but one of the best is the incredible ocean views that can be enjoyed from this 3-bedroom home. Whether you are inside or out on the deck, you can see miles of tropics and ocean as you enjoy the trade winds. In addition to the bedrooms, there are 2 bathrooms, 2 living areas, a fully equipped kitchen, and indoor/outdoor dining areas. Everything here is very comfortable and decorated in warm colors that reflect the tropical atmosphere. Several beaches are just a short drive away, and there is also a private pool at the villa for day or night swims. 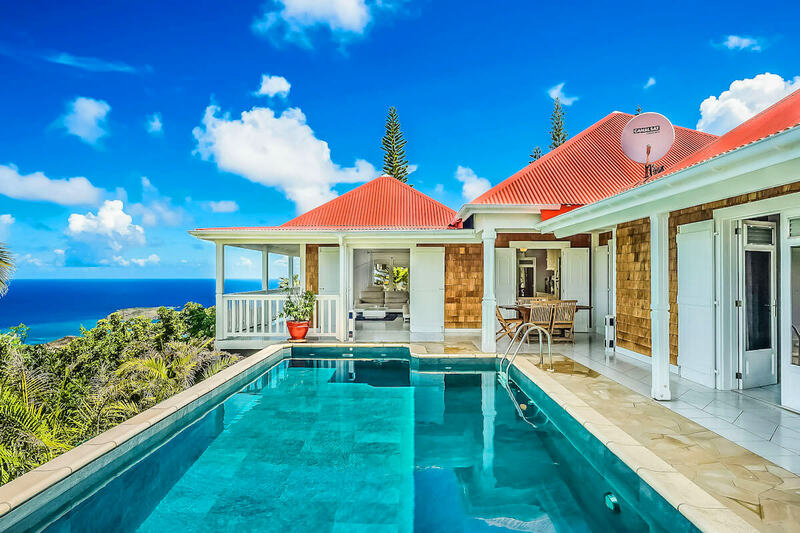 The beautiful Villa Anais in Vitet, at the center of the eastern half of St. Bart’s, offers guests great views of Grand Cul de Sac, Petit Cul de Sac, and St. Martin. Located high on a hillside facing north, the views, the warm Caribbean ambiance, the sun, and refreshing trade winds can be enjoyed from several lounging areas. The three bedrooms, two baths, and two generous living areas make Villa Anais a St. Bart favorite. On the main level, the living area opens onto commanding views. The larger mezzanine level living area is made for relaxed entertainment on comfortable sofas, with a flat screen television, French Satellite TV, and a DVD player. Villa Anais is perfect for friends traveling together or a family with small children who want privacy, peace and solitude, as well as all day sun. Short drive to several island beaches.